And too many companies are afraid to put their prices on their site. But we do have relatively standard prices, that are very similar from client to client. And we’d like to share our pricing with you in order to help you understand what services from us you might be interested in. In the process of vetting multiple agencies? Weigh the pros and cons of your options with ease. 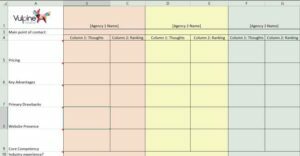 This spreadsheet will help you rank your options and show you how they stack up against each other. While we aren’t a retainer-based company, we do kind of operate like one, in that we are paid a set amount, and we work internally to allocate that budget to give our clients the best result possible based on their goals/KPIs. This means that when a client gives us more money, they can rest assured we are putting in more hours, expanding to new channels, upping our energy and efforts. And when they give us less money… We do less and they need to expect results to decline. We also start every service, no matter how big or small, with a brand audit and strategy guide. This allows us to understand the client’s voice, our “do’s and don’ts,” our KPIs, and everything we need to ensure our success. It also helps eliminate communication mishaps down the road. Also, as the client account size grows smaller, you get less and less consultation time from us. Less and less meeting and reviewing time. And reports are simplified (to only focus on the KPIs we are being paid to focus on). Note: Prices can vary from client to client and situation to situation, so please use these numbers as “ballpark” figures. Our most ideal client is coming to us with about $3,000/month to spend on our services, and ~$3,000-$10,000 in advertising budget. You have an existing brand that is getting some decent traction online. Some of your social accounts are getting organic growth, comments, etc. You’ve identified your target customer and audience and want more people like them. You have a working inbound marketing funnel and lead generation system. You are consistently closing business through your website – booking sales calls or ecommerce, etc. You have an existing email marketing strategy. You have an existing content marketing strategy and are producing stellar content. Your company is relatively secure (financially) with making a medium to long term investment in their brand. The value of our services often isn’t realized for at least 3 months, so clients need to be ready to invest in longer term marketing efforts when they work with us. One client wanted our traditional social media marketing agency services (which I will outline in just a second), but when we took a deep dive into their channels we found a better way to allocate our first months budget. We decided we would spend the entire budget on only two things: preparing to launch a viral video campaign, and setting up a very solid retargeting funnel. We also helped with basic optimization of their accounts, which is mandatory of course, but that was all we did for month one. Managing 3 main channels for the client. It’s very typical to be Twitter, Facebook, Instagram. Or if B2B, Facebook, Twitter, LinkedIn. It can of course be any of the channels we service… Whichever three we think are the most important, we take a deep focus into managing and optimizing those channels. Setting up and optimizing all social accounts, including bios, links, banners/header images, photos, albums, videos, etc. Setting up a retargeting campaign. Setting up custom audiences in Facebook for easy advertising/boosting of content. This often involves getting access to a CRM and email list. Preparing content calendar’s for social accounts. Setting up a custom reporting dashboard and process. Engaging and responding across all channels. Creating and managing growth strategies. Creating and executing on influencer outreach strategies. Managing small or one-off social campaigns or contests. Preparing content for customer engagement. Creating share for share and long term partnership strategies. Create custom short link domain. $2,000/month and ~$500-$1,000 in advertising budget. Your company is making $1mil/year or less. You’re jumping into social a little early, but you know it’s a huge part of your overall marketing strategy. You have a working inbound marketing funnel and lead generation system, but you are still kind of building it out. You’ve got someone really making it solid right now. You don’t need as much customer service or growth on social media right now. Engaging and responding across only the 3 main channels, not all social channels. (No more) Creating and managing growth strategies. (No more) Creating and executing on influencer outreach strategies. (No more) Creating group sharing strategies. (No more) Creating share for share and long term partnership strategies. You’ve decided that a strong Twitter following is important to you and want to get started growing a following right now. You are not fully ready to go “all out” on Twitter marketing, but starting now will build some social proof on your account, and make a little bit of noise to get your content some attention. This is what happens every time we start this strategy on a client account. We hook you up to our partner’s over at Social Bee with a growth and curation package, and setup and manage the strategy for both. We will create and go over a very basic hashtag strategy with you for the account. We create a series of auto-mentions that you will Tweet out to each new follower. We’ve proven time and time again that well-structured questions help to grow and engage users on Twitter and lead to overall great things for your account. We build out a content curation library for you, which we add to and manage bi-weekly. We connect to your RSS feed (and any others that you recommend) to automatically publish and recycle blog content to your Twitter feed. This is done in a completely automated way. For an additional cost, we will review, edit, and improve the posts before they go to Twitter. Cost depends on posting frequency and levels of complexity. We report on your growth, website traffic, and any other KPIs deemed necessary (conversions, sales, etc.). For an extra $200/month we will add link retargeting to the account so that every time someone clicks on a link from Twitter, going to a piece of curated content, you can add them to your retargeting pixel and begin serving ads to them. Typically, an Instagram only strategy means that you have a very visual-oriented brand and you just know Instagram is the right channel for you. You’ve got a backlog of content – mostly image/photo, short video, or quotes – that you need to start cataloging publicly to spark conversation and engagement, and drive brand awareness. Maybe you also tested Instagram, as a client of ours recently did, and found that a quick test generated some revenue. So it makes sense to hit it stronger. Instagram Growth. This involves follow for follow, liking, and maybe also commenting. There’s a couple of different strategies we can use here depending on the situation and target audience, but we can always grow a client account, no matter the circumstances. We use Kickstagram as our main growth tool, as well as do some work by hand. Engagement and responding. We will respond to any comments on our posts, and any DMs we get (That’s right, Instagram now has DMs). Creating and execute an Instagram hashtag strategy. Copywriting and preparing content for social media. Scheduling content. 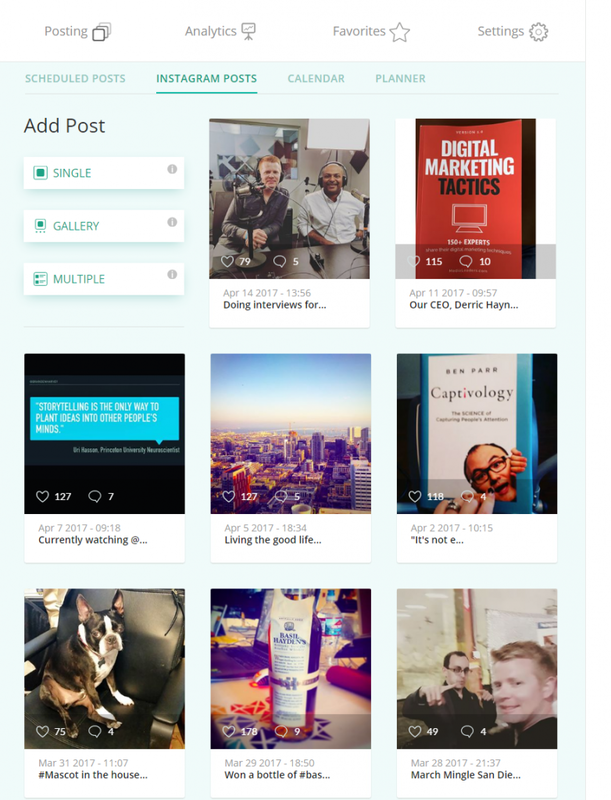 Typically we aim for 2-3 posts/day, but it can vary depending on content library, goals, etc. We typically use Onlypult for this. Creating a custom dashboard for reporting and analytics. We’ve seen some great results with other clients in terms of increasing impressions and website traffic driven from Instagram with these tactics. There’s a fine line between targeted outreach and spam. And typically spam is when you really are just trying to shove a message down someone’s throat, and you haven’t really taken the time to make sure that they are really even the right fit for that message. This is targeted outreach at its finest. This service is perfect for a company that has an exact understanding of their target job role, seniority level, industry, and/or job title of their most ideal customer. For example, “Financial Advisor” is very easy to find and hunt down using this service. We start by creating a targeted lead list of prospective customers based off your criteria. We then scrub/clean that list against existing customer databases and check it for quality. From there we create, using your input and our strategies, a series of custom messages that we want to send to these prospects. We then begin sending connection requests and messages to them. If a prospect responds, we do our best to answer their responses, so as not to bother you with your time. However, especially in the beginning, we get a lot of questions that we are unable to answer. At that point, we bring in you, the client, to answer as you see fit, and then we take your answers and create a database of questions and answers so that you never have to answer that question again. From here the goal is to book sales qualification calls, demos, or appointments. Whatever it is that you need more of. We absolutely keep a close eye on responses to ensure we are hitting the right people, that the message is well received, and that we are being decent human beings. Note: This service may require some on-site fixes and Google Analytics or CRM optimizations that will incur additional costs. $500+ setup and first month + ad spend (depends on how many website visitors/month you get, but typically $100-$1,000), $250/month thereafter. Odds are this is not all you need, but as I’ve said many times… If you aren’t running retargeting ads, you should start immediately. Getting people to your site is the hardest thing to do, Getting people that have already been to your site back… And to purchase… Is a lot easier. That’s what retargeting is all about. Here’s some more information on how to slice and dice your Facebook custom audiences. This is for you when you are getting website traffic, have a very small budget, and want to maximize the efforts of that traffic. It’s a good first step to see if you can’t get some quick wins and scale your marketing budget. We will setup and execute a couple basic retargeting campaigns, with minimal segmentation, and optimize the campaign based on ad/content in order to drive some sort of on-site conversion, typically email sign-up, lead generation, or purchase. This involves copywriting and possibly some creative skills, but does not include any blog content, lead magnet, or video creation. We require our clients have that ready to go, but can also advise on strategy or partners to help set that up. As one of the smallest services we offer, this gets you very little face time / consulting time / meeting time. And honestly, not much is needed after an initial onboarding meeting. This service is often paired with the retargeting services above for a very simple starting advertising campaign. Things can get more expensive based on the complexity of the campaign, or the advertising budget. $900+ setup and first month + ad budget (typically $1,500-$5,000/month), $500/month thereafter. This is typically for “turning on the faucet” for many of our startup or new business clients. We design one or two campaigns specifically around getting a very targeted cold traffic (they don’t know who you are) audience to learn more about your product/service/business and we start sending them down the rest of the marketing funnel. The best fit for a client that needs this service would be someone that has existing website traffic, leads, and sales coming in from their website, has a clearly identifiable target audience on Facebook, and has a great video or two or three that they believe that audience will resonate with. An ad campaign, possibly two depending on complexity and so forth, that can be ran towards cold traffic and expect to get a decent cost per view, or cost per click, that then drives traffic to your website. Weekly (or more) optimization. Copywriting. Monthly reporting. We’re going to test various target audiences, messages, creatives, and overall strategies in order to find the best opportunities for Cost Per Click (CPC), Cost Per Lead (CPL), or Cost Per customer Acquisition (CPA). We aren’t talking a “comment on my photo” contest, we’re talking about something that can generate thousands of leads and a noticeable bump in revenue. $5,000 is our typical starting point, it can go down if we operate more in a consulting role, or up if we have to get hands on in the other aspects of the campaign (development, email, etc.). You also need a budget for paid ads between $1,500 and $10,000 depending on size of the campaign, size of your email list, size of your social channels, and expectations and goals. You also need to have product(s) to donate. Typically any company could consider a social contest/giveaway for their product or service, but typically it works better for more viral consumer-facing products (that being said, there are some big B2B opportunities here as well, it’s just trickier, a little more cost per acquisition, and less viral). You obviously need the right budget, not just in cost for our services and for advertising, but also for the product you are likely to be giving away. Overall, this is an opportunity to get a ton of leads for cheap, establish key partnerships with industry influencers, and get viral brand advocacy for your product/service/brand. We will create and manage the campaign and overall strategy. Our social contest platform of choice is Queue (included in our cost) as its the best-structured platform we’ve ever seen for virality. We start with a partner outreach list and usually require a month lead time to get the contest ready to roll. We’re looking for partners that would be interested in donating product in exchange for exposure. This helps us with social media reach (we now can leverage their audience), but also to extend the demand for entering the giveaway. People might want your product, but if we get these industry related products as well, we can be intriguing to more people, thus increasing our viral coefficient. We prepare the landing page and community page for the campaign. These need to be well structured for conversion, explanation of the giveaway, and how to compete to get more entries and prizes. We create social promo packs for partners and our team to execute on, on the client’s social accounts. We create social sharing content for the participants of the giveaway. We create email marketing templates for the automated emails that come from Queue. We create the contest rules and policies. We advise or create the copy for the emails hitting the clients existing audience. Typically we don’t actually prepare and send these emails, the client actually executes. We create the advertising campaigns that will support the contest. We launch the campaign and monitor social media to engage and respond as buzz is generated. We handle unexpected issues, customer complaints, and help ensure our partners are pulling their weight. We advise on advertising changes, email changes, contestant eliminations, etc. After the contest concludes, we carry out a scrub of the list to ensure ethical participation by all participants. We help the client congratulate the winners, sell their product, and track revenue that can be attributed to the contest for the following 30 days. We create a final report on the contest and review with the client to see what worked, what went wrong, and if we should do it again. $5,000 for everything, can go up or down depending. If you run a marketing related event to our target audience – exciting brands – then we may be interested in a service for sponsorship swap, but this must be evaluated on a case by case basis. Most events are missing a huge opportunity to use social media before, during, and after their events. To leverage your event to grow your social following. Want to generate additional buzz and get more butts in seats for your event. Want to engage and respond to event attendees in order to deepen your relationship. Want to continue building a relationship with your audience after the event is finished. Want to get trending on Twitter. For the full list of everything, please check out this checklist. We are going to create a hashtag strategy for the event. Create Facebook ad campaigns for cold, warm, and hot traffic. Create social promotion campaigns for attendees, partners, sponsors, etc. (things to get them engaged on social). Create social media swipe files for attendees, partners, sponsors, etc. (Things for them to actually post to their accounts). 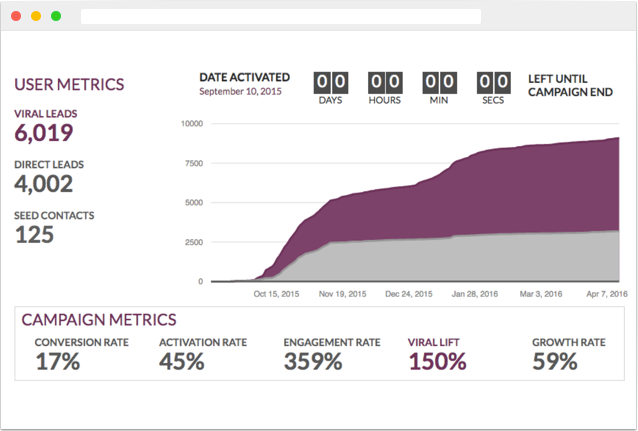 Create a strategy for real-time social media amplification. Including the creation of a social wall or other social component to the event itself. Quote and key takeaway posts. Engaging others who are posting. Taking pictures and posting to accounts (if we are on scene). Could include going “Live” and other social promotion, depending on circumstances. Follow up with attendees. Surveys/Feedback. Create a retargeting list of attendees to sell additional offer/upsell. Create a Facebook album with best event images and tag people. Create blog post of takeaways using social content. Possibly create and encourage joining of Facebook or Slack group depending on client needs. There’s a lot of things we can do as a creative marketing agency focused in social media. And we are creating new standalone services all the time. Hopefully, this gives you a firm understanding of our offering and costs in order to best prepare you choosing the right agency to do business with. In the process of vetting multiple agencies? This spreadsheet will help you rank your options and show you how they stack up against each other in terms of price, core compenticies, and other factors.